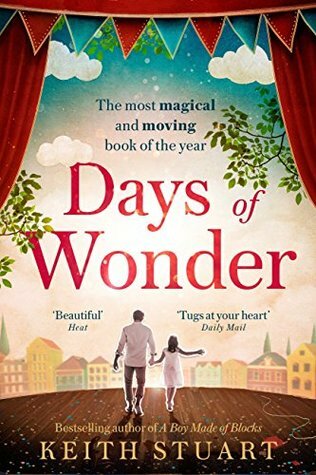 Blog Tour: Days of Wonder | Live to read. Read to live. I read Keith Stuart’s debut novel A Boy Made of Blocks last year (I talk about it here) and I absolutely loved it, so when Sphere got in touch earlier this year and tempted me with a copy of his new book, Days of Wonder, I pretty much bit their hand off. This has been one of my most anticipated books of the year and you cannot imagine how happy I am to sit here and say it does not disappoint. I loved it as much as I loved A Boy Made of Blocks. I may have loved it more. I already want to read it again. It’s about this guy called Tom, who is the manager of a small local theatre (hello my theatre loving heart. Also my bestie is on the committee of our local theatre so you know, relatability) and a single father to Hannah who was diagnosed aged 5 with a heart condition that threatens to kill her. Hannah’s almost 16 now and she’s this gorgeous gorgeous creature who refuses to let a life-limiting condition limit her life. You’ll fall in love with Hannah, I promise, she’s delicious. So we have Tom who is trying to be all things to all people but honestly – he’s struggling: Hannah is sick and the theatre is under threat of closure and he’s carrying all this weight on his shoulders and he’s on his own and trying to put a brave face on it and we have Hannah, who is so aware of her own mortality, more than any of us should be at 15, and who’s major worry is that her Dad will be alone when she’s gone and wow but doesn’t that break your heart? Well yes, actually, it absolutely does, but then it also mends it – the bond between Hannah and Tom even when she is so sick of him is a pleasure to behold and her attempts at matchmaking are the best. As is watching her navigate the waters of first love for herself. Oh, and don’t get me started on Hannah’s best friend because my heart cannot take it – I’m telling you nothing about her; you can go and meet her yourself. It’s an emotional rollercoaster this book and I LOVE it. I love Tom and Hannah and every single member of the supporting cast; I loved the way it was written with the flashbacks and the fairy stories and the comics and all of it, I didn’t even care about how it made me want to cry because on the next page it made me laugh and the whole way through I just felt….warm. You expect it to be sad but in actuality it’s the opposite. It’s just so….so…uplifting. I felt better for reading it. This is a story of love and loss and laughter, of learning to make the most of what you have and how family isn’t always blood, it’s about Dads and daughters and the wonder of imagination and fairy tales. It’s a beautifully written, sensitive book and I didn’t want it to end. You know when you want to climb inside the pages and just live in a book? This was that for me. It’s the book, actually, that book hangovers are made of. I finished this and I couldn’t let go. I WAS JUST SO IMMERSED. I finished it a while ago and I still miss these characters. It’s one of my reads of the year for sure and if you’re going on holiday this summer and need a book to lose yourself in then this should be it. I know I’ll be shoving it under the nose of everybody I know anyhow. GO AND BUY A COPY RIGHT NOW WHAT ARE YOU WAITING FOR.